The Queen became the longest serving British monarch on 9 September 2015. As Head of State, The Queen maintains close contact with the Prime Minister, with whom she has a weekly audience when she is in London. Over the reign, Her Majesty has given regular Tuesday evening audiences to 10 Prime Ministers. The Queen and Duke of Edinburgh have been married for 60 years. They were married on 20 November 1947 in Westminster Abbey. The Queen and the Duke of Edinburgh are both great, great grandchildren of Queen Victoria. The Queen is a direct descendent of Queen Victoria’s oldest son King Edward VII and the Duke of Edinburgh is a direct descendent of Queen Victoria’s third child Princess Alice. The Queen has sent 100,000 telegrams to centenarians in the UK and the Commonwealth. The Queen sends a telegraph to couples celebrating their diamond wedding aniversary. The Queen has sent more than 280,000 telegrams to couples in the UK and the Commonwealth celebrating their diamond wedding (60 years) anniversary. The Queen's real birthday is on 21 April and the date is a private celebration. The Queen's public birthday is celebrated in June with Trooping of the Colours. The Queen has opened Parliament every year except 1959 and 1963, when she was expecting Prince Andrew and Prince Edward respectively. The Queen has owned more than 30 corgis during her reign, starting with Susan who was a present for her 18th birthday in 1944. A good proportion of these have been direct descendants from Susan. Her Majesty currently has five corgis - Monty, Willow, Holly, Emma and Linnet. The Queen is 5'4" (64 inches or 160cm) tall. One at the House of Lords, two at Westminster Abbey, and six in the throne room at Buckingham Palace. In 1953–54 H.M. Queen Elizabeth II became the first monarch to circumnavigate the globe on a six month around-the-world tour with H.R.H Prince Philip also becoming the first to visit Australia, New Zealand and Fiji. Queen Elizabeth II is the first monarch to send her children to boarding schools in order to remove them from the ever-probing media. Queen Elizabeth II was the first, and so far only, female member of the royal family to actually serve in the armed forces, though other royal women have been given honorary ranks. Queen Elizabeth II was the first British monarch since the Act of Union, in 1801, to be out of the country at the moment of succession, and also the first in modern times not to know the exact time of her accession (because George VI had died in his sleep at an unknown time). She was in Kenya. 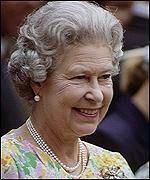 Queen Elizabeth II was the first British Monarch to visit China when she visited in 1986.